Finally, Episode 1 of Marvel’s Guardians of the Galaxy [$4.99] was released. This Telltale Series brings a new adventure to the story featuring Star-Lord (your character), Gamora, Drax, Rocket, and Groot. Due to a new movie coming out, Marvel and Telltale Games have released this series to fans of interactive mobile titles. The game begins with the Guardians discovering a mysterious and powerful artifact. Each Member of the Guardians has his own reasons to acquire the artifact but they are not the only ones that seek it. Furthermore, the series includes different locations such as Earth, Knowhere, & more. Star-Lord will be played by Scott Porter (Friday Night Lights), Gamora by Emily O’Brien (The Young and the Restless), Rocket by Nolan North (Uncharted), Drax by Brandon Paul Eells (Watch Dogs), and Groot by Adam Harrington (League of Legends). 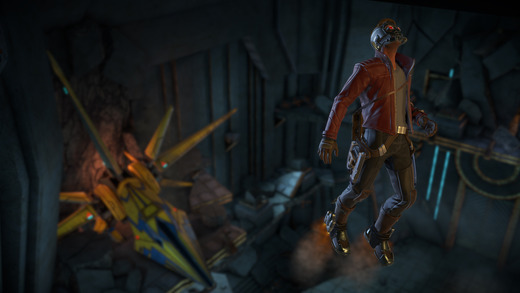 There is also more news regarding the Guardians of the Galaxy series which might excite you. Marvel and Telltale are working together to release a 5-issue prequel comic book beginning this upcoming July! Click here to read more about the plot but careful because you might pass by some spoilers. Finally, you can watch the trailer for Episode 1 below.